“Everybody finally can say it out loud, ‘my favourite rapper a Christian rapper’” jokes 23-year-old Chancelor Bennett, better known by his stage name ‘Chance The Rapper’, in a track leaked just before the release of his third mix tape, Coloring Book. It’s a seemingly paradoxical line that arrives with a clear sense of irony when one examines the variety of guests that appear on Coloring Book. Kanye West shares space with the Chicago Children’s Choir on the opener ‘All We Got’; less-than-saintly club and crowd favourites Future, Lil Wayne, 2Chainz, T-Payne, and Ty Dolla Sign rap about everything from drug addictions to issues with paying child support; whilst Jay Electronica resurfaces to share a track with Chance in which the pair share stories of their apparent conversions. Hardly the artists you would expect to be featured on a Christian release. Chicago-born-and-bred, Chance burst forth onto the scene in 2012, and has since released a series of mix tapes that have cemented his place among hip-hop’s most talented lyricists and composers whilst simultaneously remaining true to his Chicago roots. Coloring Book is a gospel mix tape of biblical proportions: the brass sections (led by Chance’s lifelong collaborator Donnie Trumpet), organ, and gospel choir lift praises that would have shaken the walls of Jericho. 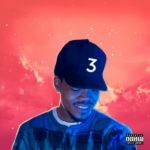 These reverent elements remind the listener that although Chance was raised on the rough streets of Chicago, Coloring Book is his joyful Sunday sermon straight from the pulpit. Fuelled by these praises, Chance’s lyrics propel the listener into a spiritual foray and comment upon the current state of the hip-hop scene. It’s a complex scene in which gun-toting, gang-leading, cash-stacking rappers are fighting for contracts and sharing bars with bible-quoting, church-going, and dare I say evangelistic rappers (see Lecrae’s Church Clothes mix tapes). And in the midst of this quagmire stands Chance The Rapper. It’s clear that Chance is unafraid to admit that he has developed a set of songs that are “for the king of all kings” (All We Got) and aim to “Magnify, magnify, lift it on high…Exalt, exalt, glorify” (How Great). It seems, from these lyrics, that Christians no longer have to fight over the small portions of gospel meat thrown at them from popular hip-hop artists like Kanye West or Kendrick Lamar. They have, in Coloring Book and Chance The Rapper, the ‘saviour’ they have been waiting for, as well as the rap-gospel crossover that Kanye West’s Life of Pablo promised to be, but never delivered on. Discarding the vainglory that has characterised 2016’s major hip hop releases (see Drake’s Views or Kanye West’s Life of Pablo for confirmation), Chance invites the faithless and the faith-filled into the journey God has taken him on during his rise to prominence. Yet even still, how do we deal with the tension between the authenticity and sinful complicity that litter the lyrics of Coloring Book? First, we must understand that for Chance, although the gaining of wisdom is not over, life and light has shone forth in Christ, shattering death and darkness. And that’s something Chance is joyful about, even if we don’t see it permeate all of his actions yet. Perhaps the next step for us, as well as for him, is to pray in line with James 1:5; “Now if any you lacks wisdom, he should ask God, who gives to all generously and without criticizing, and it will be given to him” (James 1:5). It might be of interest here that Chance’s favourite passage is Proverbs 8:1-11. In it, we read of wisdom personified, calling out to her people; “Learn to be shrewd, you who are inexperienced; develop common sense, you who are foolish…Accept my instruction instead of silver, and knowledge rather than pure gold.” (Proverbs 8:4,9). Perhaps for Chance the word of God is alive in the heart as well as in the lips. It is clear, then, that Coloring Book is as much an act of worship as my private journals are: an unharnessed insight into a young man’s heart who, knowing the joy of being in Christ as well as His call to wisdom, is learning to fight the darkness both around and inside him. Throughout the mix tape, we witness the experiences of a Gen Y young adult fighting sin, opening his lips in praise, penning worship tracks, and reflecting on worldly trappings – all the while doing so amidst a culture that is hostile to the true gospel. It’s my prayer that the same Jesus that we both seem to be living for will continue to empower his church to declare with Chance; “I know the difference in blessings and worldly possessions…” (How Great), no matter where our sphere of influence is, until the final trumpet sounds, the choir falls silent, and the true King calls us home.